The Anglo-Powhatan Wars were three wars fought between English settlers of the Virginia Colony, and Indians of the Powhatan Confederacy in the early seventeenth century. The First War started in 1610, and ended in a peace settlement in 1614. Another war between the two powers lasted from 1622 to 1632. The third War lasted from 1644 until 1646, and ended when Opechancanough was captured and killed. That war resulted in a boundary being defined between the Indians and English lands that could only be crossed for official business with a special pass. This situation would last until 1677 and the Treaty of Middle Plantation, which established Indian reservations following Bacon's Rebellion. Complications with natives typically resulted at most of the settlements the English tried to establish from the beginning. The failed Roanoke colony marked the first contact between English settlers and Algonquian coastal tribes in North Carolina. “As early as 1585 an elder by the name of Richard Hakluyt bluntly stated the English Position for the new colony: The ends of they voyage [to America] are these: 1.to plant Christian religion 2.to Trafficke 3.to conquer”. The first permanent English settlement, Jamestown Virginia (May 1607), was within the territory of the powerful yet still expanding chiefdom of Wahunsunacawh (known to the English as Chief Powhatan). The Jamestown location was less than successful, because the conditions of this swampy area were far less than desirable, including: polluted water, significant amount of insects that carried disease, and soon, the lack of food supply. Jamestown, and the other colonies to be established in the "New World" needed to be dependent on natives for a successful settlement. Captain John Smith, a colonial leader, imagined that someday the Virginia Indians would be doing all the work for the English, but Powhatan envisioned something different: he wanted Smith and the colonists to forsake the swamp and instead live in one of his satellite towns called Capahosick where they would make metal tools for him in exchange for full provision. However, Smith underestimated the power of the Virginia Indians and what they were capable of, as they knew the land much better than the English. In December 1607, only seven months after building the fort on Jamestown Island, Smith, while reconnoitering the countryside near Orapax, one of Powhatan's capitals, was captured by a communal hunting party led by Opechancanough. Smith much later in life claimed that during his captivity, Pocahontas had dramatically saved him from Powhatan's clubs, but historians differ as to whether or not this was propaganda, or an actual native ritual. Smith's capture represented just an example of the diplomatic strategies employed by Wahunsunacawh to make the English cooperate with and contribute to his expanding control in this region. Smith was released in time for New Year's 1608, when he promised to move the colony to Capahosick. Smith had convinced the grand chief that he was the son of Captain Newport, and that Newport was their head weroance (tribal chief). Relations between the two peoples began deteriorating again in late 1608, when the starving colonists began to strong-arm some supplies of corn from the natives, who had likewise had a bad harvest. Smith's contacts with rival tribes around the Chesapeake Bay in the summer, and Captain Christopher Newport's military expedition to the Monacan country that fall, had not helped matters. By spring 1609, the local Paspahegh tribe had resumed raiding the English fort at Jamestown. However, their weroance, Wowinchopunk, declared an uneasy truce after he was captured and escaped, and as a result some colonists were even allowed to board in Indian towns. Then Smith, who had become president of the colony the preceding fall, antagonized the Powhatan further in summer 1609, by attempting to establish new forts in their territory. First he sent a party with Captain John Martin to settle in Nansemond territory. When they could not purchase the island with their temple, Martin ransacked it and the burial platforms of their weroances, and occupied it by force, which was not well received. Later he abandoned the position after 17 of his men, disobeying orders, were wiped out while trying to buy corn at the Kecoughtan village (now Hampton, Virginia). Smith also sent 120 men with Francis West to build a fort far upriver, at the falls of the James, right above the main town of the Powhatan proper (and the present site of Richmond, Virginia); Smith purchased the site from Wahunsunacawh's son, Parahunt, but this ended up faring no better. Smith was then injured in an accidental gunpowder explosion, deposed as president, and sailed to England on October 4, 1609, and the colony began to starve. Soon afterward, the settlers succeeded in establishing a second fortification, Fort Algernon at Old Point Comfort, right beside the Kecoughtan village. In November, the Powhatan ambushed and killed Captain John Ratcliffe, who had gone to Orapax to buy corn. Francis West sailed to the Patawomecks, a fringe group among Powhatan's subjects, for corn, but beheaded two of them, then absconded directly to England. Unable to trade with the natives, the English began to starve to death, to the point that when Sir Thomas Gates arrived in late May 1610, he decided to evacuate Jamestown. However on their second day of sailing, they met Lord de la Warr (Francis West's older brother) coming into the Bay with the remnant of his fleet, which had left England one year earlier, but been scattered in a hurricane. They therefore returned to the fort under de la Warr's command. The nobleman, Lord de la Warr, proved far harsher and more belligerent toward the Indians than any of his predecessors, and his solution was simply to engage in wars of conquest against them, first sending Gates to drive off the Kecoughtan from their village on July 9, then giving Chief Powhatan the ultimatum of either returning all English subjects and property, or facing war. Powhatan responded by insisting that the English either stay in their fort, or leave Virginia. Enraged, De la Warr had the hand of a Paspahegh captive cut off and sent him to the paramount chief with another ultimatum: Return all English subjects and property, or the neighboring villages would be burned. This time, Powhatan did not even respond. On August 9, 1610, tired of waiting for a response from Powhatan, De la Warr sent George Percy with 70 men to attack the Paspahegh capital, burning the houses and cutting down their cornfields. They killed 65 to 75, and captured one of Wowinchopunk's wives and her children. Returning downstream, the English threw the children overboard, and shot out "their Braynes in the water". The queen was put to the sword in Jamestown. The Paspahegh never recovered from this attack, and abandoned their town. Another small force sent with Samuel Argall against the Warraskoyaks found that they had already fled, but he destroyed their abandoned village and cornfields as well. Following these attacks, and the offense of killing royal women and children, both sides now found themselves at war. That fall, a party of Englishmen was ambushed at Appomattoc; soon afterward Lord de la Warr managed to establish a company of men at the falls of the James, who stayed there all winter. In February 1611, Wowinchopunk was killed in a skirmish near Jamestown, which his followers revenged a few days later by enticing some colonists out of the fort and killing them. In May 1611, a new governor, Sir Thomas Dale, arrived and soon began looking for places to establish new settlements; he was repulsed by the Nansemonds, but successfully took an island in the James from the Arrohattocs, which became the palisaded 'cittie' of Henricus, despite raids there led by the renegade warrior Nemattanew, or as they dubbed him, 'Jack of the Feather'. Around Christmas 1611, Dale and his men seized the Appomattoc town at the mouth of their river, and quickly palisaded off the neck of land, renaming it 'New Bermudas'. The aged chief Powhatan made no major response to this English expansion, and he seems to have been losing effective control to his younger brother Opechancanough during this time, while the English consolidated their new footholds. In December 1612, Argall concluded peace with the Patawomeck; while there in April 1613, he managed to capture the great chief Powhatan's own daughter, Pocahontas, delivered into his hands by Japazaws, brother of the Patawomeck weroance. This caused an immediate ceasefire from the Powhatan raids on the English, as they held her ransom for peace. In the meantime, English settlers had begun to expand to south of the rivers, building houses at City Point in what is now Hopewell, Virginia. In early 1609, Jamestown Island had been the only territory under English control. By the end of this period, the Powhatan had lost much of their riverfront property along the James to the English conquest; the Kicoughtan and Paspehegh subtribes had been effectively destroyed, and the settlers had made major inroads among the lands of the Weyanoke, Appomattoc, Arrohattoc, and Powhatan proper. Two James river tribes, the Arrohattoc and Quiockohannock are not heard from again after this, possibly indicating that they had been dispersed or merged with the other chiefdoms. Peace negotiations stalled over return of captured hostages and arms for nearly a year; finally in March 1614, Dale went with Pocahontas and a large force to find Powhatan himself. Getting a shower of arrows at present-day West Point, they went ashore and sacked the town; finding Powhatan at his new capital Matchcot. They finally concluded a peace that was sealed by the marriage of Pocahontas to the colonist John Rolfe. This was the first known inter-racial union in Virginia, and helped usher in a brief period of better relations between the Indians and the newcomers. A separate peace was concluded the same year with the autonomous Chickahominy tribe which even made them honorary "Englishmen", thus subjects of King James I. Following the 1614 marriage of Rolfe and Pocahontas, relative peace and good relations reigned for several years. This time has been called the "golden age of Powhatan-English relations, in English eyes". It has also been called the peace of Pocahontas. In 1616, when Governor Dale had gone to England along with Pocahontas, the Chickahominy refused to pay their corn tribute to the new governor (George Yeardley), rejected their alliance with the English, and instead finally became a part of Chief Powhatan's Confederacy. Following Chief Powhatan's death in 1618, his younger brother Opechancanough assumed full power, and Nemattanew continued to be a prominent figure alongside him. Opechancanough maintained a friendly face to the colony, and finally even met with an English minister to give the appearance of his imminent conversion to Christianity. Then on Friday, March 22, 1622, his subjects, planted among the settlements, struck without warning, in what is now known as the Indian Massacre of 1622. 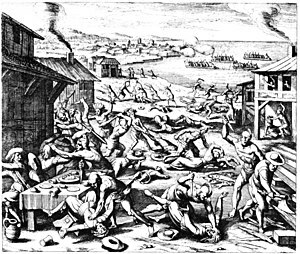 A third of the colony were wiped out that day; were it not for last minute warnings by Christianized natives, a higher toll would have been certain. Powhatan military doctrine did not call for an immediate follow-up blow, but rather to wait and see what would happen after inflicting such a blow, in hopes that the settlement would simply abandon their homeland and move on elsewhere. However, English military doctrine did not call for reacting this way. For the next ten years, they marched out nearly every summer and made assaults on Powhatan settlements. The Accomac and Patawomeck allied with the English, providing them corn, while the English went to plunder villages and cornfields of the Chickahominy, Nansemond, Warraskoyack, Weyanoke and Pamunkey in 1622. In 1623 Opechancanough sued for peace. The colonists thus arranged to meet the natives for a peace agreement, but poisoned their wine, then fell upon them shooting them and killing many in revenge for the massacre. They then attacked the Chickahominy, the Powhatan proper, the Appomattoc, Nansemond and Weyanoke. In 1624 both sides were ready for a major battle; the Powhatans assembled 800 bowmen, arrayed against only 60 Englishmen, who attempted to destroy the Powhatans' cornfields. When the Englishmen finally succeeded in destroying the cornfields, the bowmen gave up the fight and retreated. A shortage of gunpowder in the colony delayed the colonists from going on marches in 1625 and 1626. The natives seem not to have been aware of this shortage, and were themselves desperately trying to regroup. However, summer 1627 brought renewed assaults against the Chickahominy, Appamattoc, Powhatan proper, Warraskoyak, Weyanoke and Nansemond. A 'peace' was declared in 1628, but it was more like a temporary ceasefire; hostilities resumed in March 1629 and continued until a final peace was made on September 30, 1632. The English began to expand their settlements on the Eastern Shore and both sides of the James, as well as on the south of the York, and in 1633, they palisaded off the peninsula between the York and James at about Williamsburg. By 1640 they began claiming land north of the York as well, and in 1642, Opechancanough leased some land on the Piankatank to English settlers for the price of 50 bushels of corn a year. After twelve years of peace following the Indian Wars of 1622-1632, another Anglo–Powhatan War began on March 18, 1644, as a last effort by the remnants of the Powhatan Confederacy, still under Opechancanough, to dislodge the English settlers of the Virginia Colony. Around 500 colonists were killed, but that number represented a relatively low percent of the overall population, as opposed to the earlier massacre (the 1622 attack had wiped out a third; that of 1644 barely a tenth). However, Opechancanough, still preferring to use Powhatan tactics, did not make any major follow-up to this attack. This was followed by a last effort by the settlers to decimate the Powhatan. In July, they marched against the Pamunkey, Chickahominy, and Powhatan proper; and south of the James, against the Appomattoc, Weyanoke, Warraskoyak, and Nansemond, as well as two Carolina tribes, the Chowanoke and Secotan. In February 1645, the colony ordered the construction of three frontier forts: Fort Charles at the falls of the James, Fort James on the Chickahominy, and Fort Royal at the falls of the York. In August, Governor William Berkeley stormed Opechancanough's stronghold and captured him. All captured males in the village over age 11 were deported to Tangier Island. Opechancanough, around 100 years old, was taken to Jamestown where he was shot in the back by a guard. Opechancanough's death resulted in the disintegration of the Powhatan Confederacy into its component tribes, whom the colonists continued to attack. In March 1646, the colony decided to build a fourth frontier fort, Fort Henry, at the falls of the Appomattox, where the modern city of Petersburg is located. In the peace treaty of October 1646, the new weroance, Necotowance, and the subtribes formerly in the Confederacy, each became tributaries to the King of England. At the same time, a racial frontier was delineated between Indian and English settlements, with members of each group forbidden to cross to the other side except by special pass obtained at one of the newly erected border forts. 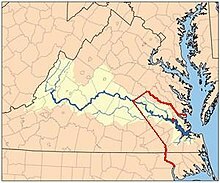 The extent of the Virginia colony open to patent by English colonists was defined as: All the land between the Blackwater and York rivers, and up to the navigable point of each of the major rivers - which were connected by a straight line running directly from modern Franklin on the Blackwater, northwesterly to the Appomattoc village beside Fort Henry, and continuing in the same direction to the Monocan village above the falls of the James, where Fort Charles was built, then turning sharp right, to Fort Royal on the York (Pamunkey) river. Necotowance thus ceded the English vast tracts of still-uncolonized land, much of it between the James and Blackwater. English settlements on the peninsula north of the York and below the Poropotank were also allowed, as they had already been there since 1640. The war's end ushered in 30 years of relative peace between the colonists and the Powhatan, shattered only by the attacks of Bacon's Rebellion in 1676. This resulted in the Treaty of Middle Plantation signed by Cockacoeske, Powhatan's matrilineal successor. The treaty set up reservations for each tribe, and allowed them hunting rights outside their reservations. It established that all the Indian rulers were equal, with the proviso that the "Queen of Pomunky" was now owed the ancient subjection of several scattered groups of Indians. Under her next two successors, lands within the original Pamunkey reservation, which was coterminous with King William County, Virginia, would be sold to the English, resulting in the relatively small Pamunkey and Mattaponi reservations of the present. ↑ 1.0 1.1 1.2 Puglisi, Michael J. (1991). "Capt. John Smith, Pocahontas and a Clash of Cultures: A Case for the Ethnohistorical Perspective". pp. 97–103. JSTOR 494612. ↑ Glenn, Keith (1944). "Captain John Smith and the Indians". pp. 228–248. JSTOR 4245316. ↑ Helen Rountree, Pocahontas's People, p. 38. ↑ Rountree 1990, p. 55n; she notes that while historians such as Fausz place the beginning in 1609, her 'emphasis on diplomatic relations' would rather date the outbreak of the full-fledged war to 1610. ↑ Rountree, p. 80 n.
↑ 9.0 9.1 9.2 Spencer C. Tucker; James R. Arnold; Roberta Wiener (30 September 2011). The Encyclopedia of North American Indian Wars, 1607–1890: A Political, Social, and Military History. ABC-CLIO. pp. 17–19. ISBN 978-1-85109-697-8. http://books.google.com/books?id=JsM4A0GSO34C. Retrieved 30 March 2013. Grenier, John (2005). The First Way of War, American War Making of the Frontier, 1607-1814. New York: Cambridge University Press. pp. 24–25. ISBN 0521845661. Rajtar, Steve (1999). Indian War Sites. Jefferson, NC: McFarland. ISBN 0786407107. Rountree, Helen (1990). Pocahontas's People. Norman: University of Oklahoma Press. ISBN 0806122803.